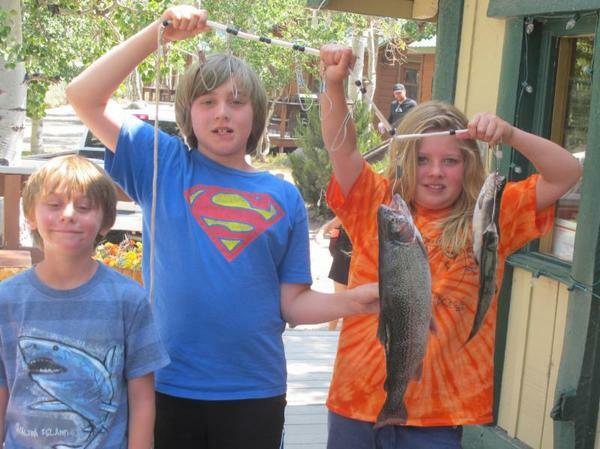 Catch of the Week: The locals take the title of "Catch of the Week" with a 3 pound 12 ounce Rainbow. 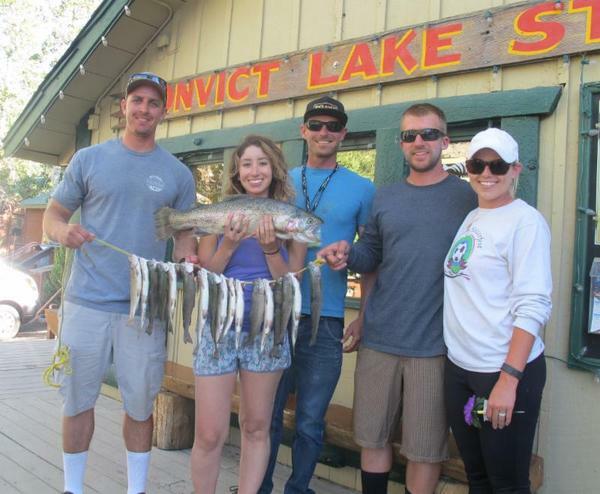 Kaitlin, Jack and Sam from Mammoth Lakes, CA caught the winner with Powerbait at the South Shore. Francis Ishida of Gardena, CA with two stout Rainbows from the Inlet. The larger Rainbow was 3 pounds 9 ounces and the another was 2 pounds 12 ounce. Both were caught with Pinched Crawlers. Greg Luber from Corona, CA with two beauties, weighing in at 3 pounds 6 ounces and 2 pounds 1 ounce. Greg was trolling a Tasmanian Devil. 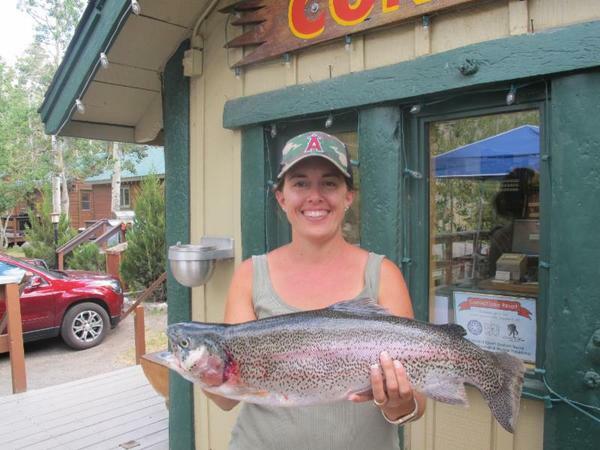 Anastasia Martin of Banning, CA hooked into a fat 3 pound 3 ounce Rainbow using Yellow Powerbait. She was fishing at the Inlet. Tactics/Bait: Some of the nicer fish and full stringers were caught with Pinched Nightcrawlers (Pink or Natural are always successful colors), Powerbait, Nightcrawlers, Mice Tails and if you're trolling use Tasmanian Devils. In the creek, use salmon eggs and small spinners. The most successful Powerbait colors were Yellow, Orange and Salmon Peach . And remember garlic, garlic and garlic. I would use some type of added attractant on your lures, nightcrawlers and jigs. Pro-Cure, Bait-On, Lip Ripperz and Berkley all make excellent attractants, which are sold at the general store. The South Shore and the Inlet were the hottest spots this week. Other locations fishing well were the North Shore, the Handicap Pier and Hangman's Tree. Weather: The forecast for next week is calling for some beautiful weather with clear and sunny skies. The high temps starting Monday will be in the mid-70s and the lows will be in the low-50s. Here is the National Weather Service link that is usually quite accurate: 7-Day Forecast Convict Lake. Sunrise - Sunset: Sunrise this week 6:04am - 6:09am and Sunset 8:00pm - 7:53pm. Stocking: The DFW is scheduled to plant both the lake and creek the week of August 8th.